Preventive treatment for dry, sensitive and parchment-like foot skin in patients with diabetes mellitus. For use on the whole foot, including between the toes and around wound edges2. 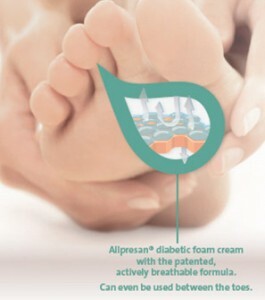 Allpresan® diabetic Foam Cream BASIC is a medical device for the specific treatment of dry and sensitive foot skin in patients with diabetes mellitus. Its special properties also make it suitable for the treatment of wound edges. 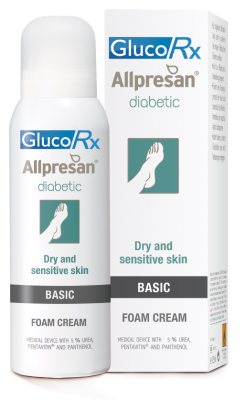 Allpresan® diabetic Foam Cream BASIC boosts the skin’s barrier function, thus protecting against skin infections and ulcerations3,4,5. The specially designed active formula forms a breathable, two-dimensional protective coating. It strengthens the barrier function, protects against external impacts, and reduces mechanical stresses such as friction without impairing natural skin function3,4,5. The skin is optimally supplied with moisture, and Pentavitin® also guards against moisture loss. Reduces roughness, counteracts pressure marks and smooths the skin2,5. Please feel free to download the pdf here which contains the full product information. Adverse events should be reported. 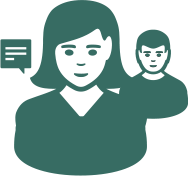 Reporting forms and information can be found at www.mhra.gov.uk. The patented actively breathable Allpresan formula creates a fine mesh on the skin which repairs and strengthens the damaged skin barrier and thus, protects against skin infections and ulcerations4,5. Approximately 80% of people with diabetes mellitus suffer from some kind of skin problem as a consequence of high blood sugar levels. 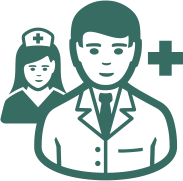 Typical symptoms include extreme dryness, calluses, pressure ulcers and cracks on the feet, foot fungus and the tiniest wound being a real danger for them1. The sweat and sebaceous glands become imbalanced and often fail to work properly, leaving the skin without an adequate supply of oil & moisture. Thus the skin becomes rapidly rough and scaly. The problem is most visible on the legs and feet. Intensive daily care to the feet must therefore include an appropriate skin care regime to replenish the skin’s moisture and fat content, as well as create a protective layer against the outside environment1. GlucoRx Allpresan is a product of GlucoRx Ltd. GlucoRx Allpresan is a foam cream with an innovative route of administration for the care and treatment of medical and cosmetic skin problems.